“Weight” and “fat” are not the same thing, whatsoever. They are almost universally used interchangeably, but they are not interchangeable, and mountains of pain lie that way. 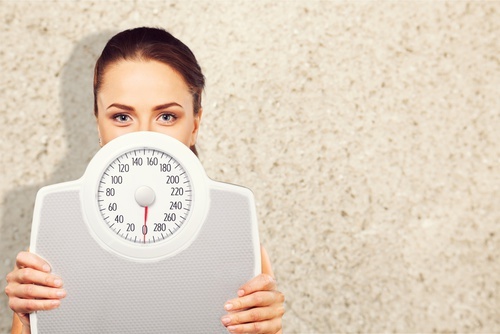 What we weigh is irrelevant to how we look or feel—or anything. And that innocent/ignorant sloppy conflation, that imprecision, is actually costing us, a LOT, because what we do to change that number isn’t necessarily the same as what we can do to get healthy, fit, strong or lean. Tons of poor health and suffering and frustration and counterproductivity ensues as a result—but clarity and education could change that. Incredibly, it’s almost never questioned that “weight” is not a THING. A pound is not a thing. It is a measurement of a thing. Weight is not something you can “lose.” You can lose things. You can’t “lose” weight. Weight can decrease, yeah. But you don’t “lose” it like you lose your keys or your hair or your teeth. We don’t say it “lost degrees out” when it gets colder. You can’t “shed pounds” like a dog sheds hair. You CAN lose or gain fat or muscle (or water or hair or shoes) but not “weight.” Yet weight is nearly universally spoken of as if it is always fat, which it is not. As if is something you can hold in your hand. And “lose weight” is assumed to be interchangeable with “healthy living,” which it resoundingly is not. Weight is a measurement that can rise and fall. The weight of any thing, including a body, can go up or down. But it going down, generically, doesn’t even measure what people mindlessly assume it does. And making it go down doesn’t necessarily and automatically involve, or mean, health. Often quite the opposite. Whether it’s someone saying “I need to take off 5 pounds” or “I want to lose 50 pounds,” it’s CODE for what the person really means. Their “weight” is not the issue. Why don’t we say what we mean? Why do we say oblique, vague things like “shed unwanted pounds” and not question that there are no “pounds” on our body? When people talk about wanting to “lose weight”—or health professionals say you should—they really mean something deeper and more specific. But instead of naming it (e.g. “I want to lose fat” or better yet “I want to be healthier, stronger, fitter, more energized, leaner, more disease-proof, more active, age better” etc. ), they conflate it with this catch-all concept that is, tragically, a red herring for what they are really after. This might seem like hair-spitting semantics, but it is not. Because “driving down the number on the scale” is NOT the same endeavor—not the same life—as eating, moving, resting, and otherwise nourishing for health, fitness, well-being, fat loss or any related goal. “Losing weight” and “getting healthy” are not at all interchangeable, as they are assumed to be. This indirect, oddly euphemistic, “middleman” measurement doesn’t actually reflect health, fitness or well-being—or even fat loss or muscle gain. What’s more, the gyrations most people engage to push that number down are not the same actions it would take to become healthier, fitter, stronger, or leaner. In fact, the classic interventions that “push the number down” are biologically/physiologically antithetical to health and fitness (and even just fat loss). And that’s not rocket science—just essential physiology and common sense, vexingly buried and concealed from everyday knowledge. I can explain it; so can others who are conscious of this. I can illuminate the nonsensical nature of this strange convention, and the actual costs—in dollars and in suffering—of continuing with this misplaced language and thinking. I can show how losing “weight” doesn’t tell you anything; how losing it is NOT “always good” (for example, I myself weigh considerably less than I used to for certain reasons, but am also less lean—fatter—than I used to be; you can weigh less and have more fat). And, I can describe why physiologically, the standard methods of manipulating “weight” lead to the body actually making, storing and conserving fat (evolutionary mechanisms that science knows about and has long documented)—as well as reduce lean muscle mass, which in turn further reduces metabolism as well as strength and energy. This irony is responsible for the “yo-yo” effect that is not a head-scratcher, but in fact 100% biologically predictable (it’s not from lack of willpower). Even health authorities (from medicine to the fitness industry) use “weight loss” and “fat loss” as if they are interchangeable, when they are not. There is absolutely no correct “weight” for anyone. The idea that you could know what you are “supposed” to weigh makes no more sense than the idea that a person at the deli counter would know what you meant if you requested “five pounds” without further clarification. Obesity IS a ginormous issue in healthcare and in quality of life for Western culture (a recent review of studies showed that obesity has doubled in 73 countries over the last few decades). In the US, more than two-thirds (68.8 percent) of adults are considered to be “overweight” (read: overfat) or obese. More than one-third (35.7 percent) of adults are considered to be obese. Yet obesity is NOT a “weight” problem. It is a fat problem (and more to the point, a health problem arising mostly from a knowledge problem and an inspiration issue). And “losing weight” solves NONE of that. The result of “reduced weight” doesn’t solve it. The process of “losing weight” doesn’t solve it either, but instead makes the problem worse for most—because they have lost “pounds” whose content/makeup was never stated or indicated, and therefore some of it was valuable metabolically active tissue. Cardiovascular disease is still the number one killer of men and women in this country—by far. And “losing weight” is NOT the answer to that either, because “weight” is not an actual substance, it is not “automatically” fat, and losing indeterminate “weight” doesn’t guarantee (and usually harms) health. And it’s far more impolite to lead people down an unhealthy and unproductive road for all their lives. And we need to be logical about what to measure, if anything. The thing is, when we nourish our bodies well and become healthy, strong and lean, we know, because we SEE it. We FEEL it. That is the only measurement we actually really need. We would know if someone were obese or overfat, wouldn’t we—even if not one scale existed in this planet? And if they lose fat, we know it without weighing them, too. If we must measure, there are many biomarkers that identify metabolic and chronic disease, but “weight” is NOT one of them. The lack of critical thinking in all this is astonishing—it’s a giant cultural agreement that must be broken because it is DAMAGING. It is insanity that this is not more widely known and discussed, and I am passionately committed to changing that. It would, and will, have a direct impact on the health and fitness of Americans. IMPORTANT NOTE: When I say weight doesn’t matter, many people at first assume I mean (a la the “body positivity movement”) that it’s just fine to be fat, and we should leave it alone. They equate “weight doesn’t matter” with “fat doesn’t matter; my size and condition does not matter.” People assume this because they sloppily equate all “weight” with fat. I have to distinguish: No, I don’t mean just be fat, because excess body fat is generally shown to be less healthy in umpteen ways, and also less happy for most people. But I’m not addressing it as a beauty issue or a moral issue. I’m concerned for health, for fitness, for people having bodies that last long and well, that let them move and give and live as they wish, let them give their best to life. Not that I’m against body positivity in the least! It’s a good thing and not mutually exclusive. What I’m against is an inexplicable, nonsensical conflation that keeps many millions of people in the fuzzy dark about their bodies, health, and what they really want. I’m not saying judge and vilify yourself or others for their size or bodyfat (or anything). I’m saying if you do want to change your size or bodyfat—or more importantly, your health, fitness, energy, strength, and pleasure—your weight doesn’t measure or determine any of that. Not knowing what you are talking about gets you in trouble usually in life. Not knowing how your body works has made us sitting ducks for every crazy fad to come along, and for food marketing that often operates like vultures. Not knowing what you are wanting to “lose,” or SAYING it, makes your results as vague as your language. You will lose much more than you bargained for. It’s like “be careful what you ask for.” When you lose “pounds” that is just what you get, but it is not exactly what you probably intended. It’s not helping people be healthier. The pervasiveness of this misleading, misguided conceptual and its consequences has me tearing my hair out as a fitness professional. We can do this SO much better. But we need it to be a mass movement. I am passionate about changing the negative, thoughtless, knee-jerk and unproductive cultural conversation around health and fitness that costs so many the potential of an energized and vital life. And about seeing that kids grow up knowing how their bodies work and how to care for them. Changing this piece of the health-fitness language lexicon is about as big as “ending world hunger” or “creating world peace”—but someone has to begin.